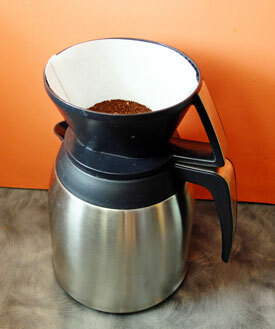 Our review of the Bonavita BV1800 coffee maker. The Bonavita BV1800 drip brewer - our newest and favorite coffee maker. 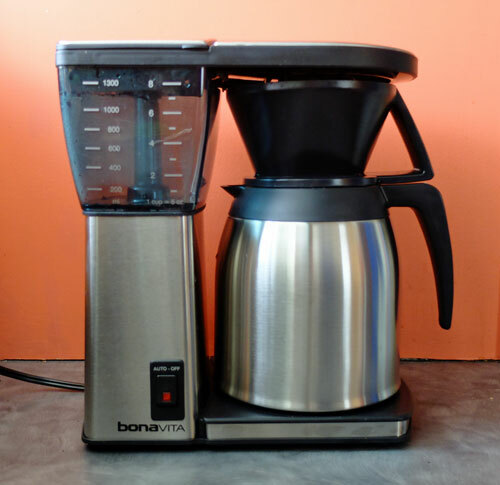 The Bonavita BV1800 with a thermal carafe. In a hurry to get one? The Bonavita BV1800 is available at Amazon.com. I have wanted a Bonavita brewer for over a year now. But with so many brewers in the house already, I couldn’t bring myself to buy another one. Fortunately, my resolve broke last week and we took delivery of our very own Bonavita BV1800. It’s the version with the thermal carafe, as you can see from our photo above. First let me tell you why we chose this particular brewer, and then I’ll share our experiences with it so far. I was first told about the Bonavita by George Howell. George was one of the pioneers of the specialty coffee industry back in the 1970s. He founded The Coffee Connection in Boston, and later sold it to Starbucks. He now owns and runs George Howell Coffee. The thing about George is that he is one of the fussiest coffee drinkers on the planet. He sells only the finest coffees, and makes sure they are roasted and brewed to perfection. Anyway, I interviewed him last year and asked him how he brewed his coffee at home. I was expecting him to tell me he made each brew by hand, using a Chemex or something similar. But that isn’t the case. He uses a Bonavita drip brewer . When I asked him why, he told me that the Bonavita makes as good a cup of coffee as any other method. So why would he waste his time with something like a Chemex when he could use a drip brewer? Well, if this brewer is good enough for George, it’s certainly good enough for me. And he’s not the only one who is a fan of the Bonavita. It’s also one of very, very few brewers that are approved by the Specialty Coffee Association of America. It has George’s approval, and the SCAA’s approval, because it gets everything right. It (1) heats the water to the right temperature, (2) sprays the water evenly across all the coffee grinds, and (3) is designed to ensure that the water and coffee remain in contact for exactly the right length of time. There are just three things to get right there…but the vast majority of home brewers get one or more of those things wrong. Inexpensive brewers get all of them wrong. As for our own experience, we haven’t been disappointed. The brewer may not have any fancy bells and whistles, like timers. Instead, it focuses just on the things that really matter. And we like that. We like the total focus on making the best possible cup of coffee. One thing we did notice is that we need to use less ground coffee per cup than we usually use. For our first brew I weighed the coffee grinds to the nearest gram, according to the amount of water I put in the reservoir. But the resulting brew was way too strong. I experimented a bit and now use about 10% less ground coffee for each pot I brew. Because of the correct temperature of the water, and how the brew head spreads the water evenly over all the coffee grinds. In other words, with most brewers you need to use more coffee to compensate for the flawed design of the coffee maker itself. On top of that, this coffee maker costs a lot less than most other so-called “quality” brewers. In conclusion, we love the Bonavita and I can’t think of a reason why I would use anything else for the foreseeable future. If you can’t find the Bonavita BV1800 in a store locally, you can order it from Amazon.com .